Coming back from my quick trip to Canada, my return itinerary also brought me back through Burlington, so I decided to check out another newcomer to the Burlington scene: Guild Fine Meats. Guild Fine Meats is the latest storefront operation from the folks that brought you Farm House Tap and Grill and El Cortijo. Back about a year ago, their opened their fine dining steakhouse, Guild and Company, on Williston Road in South Burlington. More importantly, they also took over the Winooski warehouse that was being run by SamosaMan (who seems to have disappeared from the Vermont dining scene after a run-in with the Vermont Department of Labor back in 2011), and turned that into their meat commissary, where they do their own butchering, aging, and other charcuterie supporting their several businesses. Well, earlier this summer they decided to open up a retail operation selling their meats, as well as sandwiches made from them. Located across from City Hall Park, next to American Flatbread, in a small standalone building that used to house Pacific Rim Cafe (which always looked good, but was always closed whenever I was in Burlington). They’ve converted the first floor into a store with both a deli/butcher counter and a sandwich counter. The butcher counter has some rather nice cuts of meat and deli dishes in it, a rotating selection depending on what they’ve brought over from the commissary, but on this visit there were several great looking ribeyes and a few other steaks in the case. However, the sandwich counter was the reason I came. They’ve got a large range of sandwiches, including breakfast sandwiches, subs, and most common deli meat sandwiches (one item that was particularly obvious in its absence was bacon, which surprises me, since small scale producers can often make some outstanding bacon). 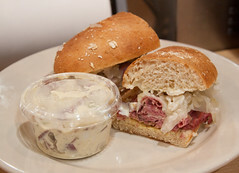 I have a hard time resisting a good pastrami, so I ended up ordering their hot pastrami sandwich and a side of potato salad. This was a classic example of a good sandwich firing on all cylinders: Every component worked, and worked well. The foundation of the sandwich was a nice thick layer of a particularly flavorful, tender, flaky, and spicy pastrami, some of the best I’ve had in recent history. Add on a layer of locally-made fresh sauerkraut, a layer of nice Swiss cheese, and a tangy aioli on a nice soft wheat bun, and I’d love to have another of these. As an added advantage, they potato salad was really good as well, a potato-rich (I hate mayo-heavy potato salad) with rich chunks of soft golden potato, and lots of onion and celery in a light mayo sauce, and this was the perfect side as well. About my only disappointment is that they didn’t have any extra pastrami in their deli case that I could get sliced to-go. 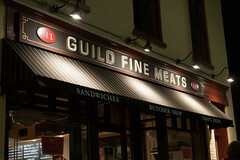 Overall, I rather enjoy Guild Fine Meats. 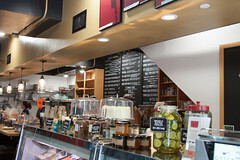 They’ve got some very nice deli sandwiches made with some great local cold cuts. I’ll have to make a note to also go check out their elder sibling, Guild and Company.